GROW YOUR BLOG - 2015!! 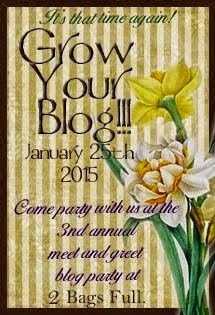 I am so happy to join in the fun in the 'Grow Your Blog 2015' party organized by the amazing Vicki Boster of 2 Bags Full. I can't wait to go visiting and meet some new friends and also to welcome you to my blog. First of all, my name is Mary Anne (better known as MA). My husband and I are retired and live in southern Ontario Canada in an apartment overlooking the local river. We have two sons, two daughters-in-love, and a handsome 8 month old grandson. Vicki suggests that we tell you why we blog so here goes....When I started to blog I simply used it as a tool in order for my kids to be able to see pictures of what I was working on at the time. I never, in my wildest imagination, ever thought anybody else would be the least bit interested in my mumblings. Slowly people discovered my little blog and suddenly I had a few readers. That, in turn, led me to feel a small sense of responsibility that I should produce something so they actually had something to read. It grew from there and now I am happy to say that I have made a lot of great friendships through blogging. One of several crazy quilt purses I have created. My passion is crazy quilting (as a look through my blog will attest!). All the crafts I have learned to do over the years have pretty much culminated into one art form, one I never grow tired of. I like the variety of things that can be utilized into crazy quilting (eg. old jewelry, laces, ribbons, found objects) and that many of the materials I use are recycled. Being able to create something beautiful and useful from things that would otherwise be thrown away is very exciting. A large wall hanging created in an online class with Karen Ruane. My interest in crazy quilting began in 1999 when I got a computer with access to the internet and came across the 'CQMagOnline' and 'The CQ Newsletter' (now out of print). I was fascinated and a passion was born. I went from there to joining online groups and taking part in round robins and exchanges with those already working in the field. It was a giant learning curve but ever so much fun! 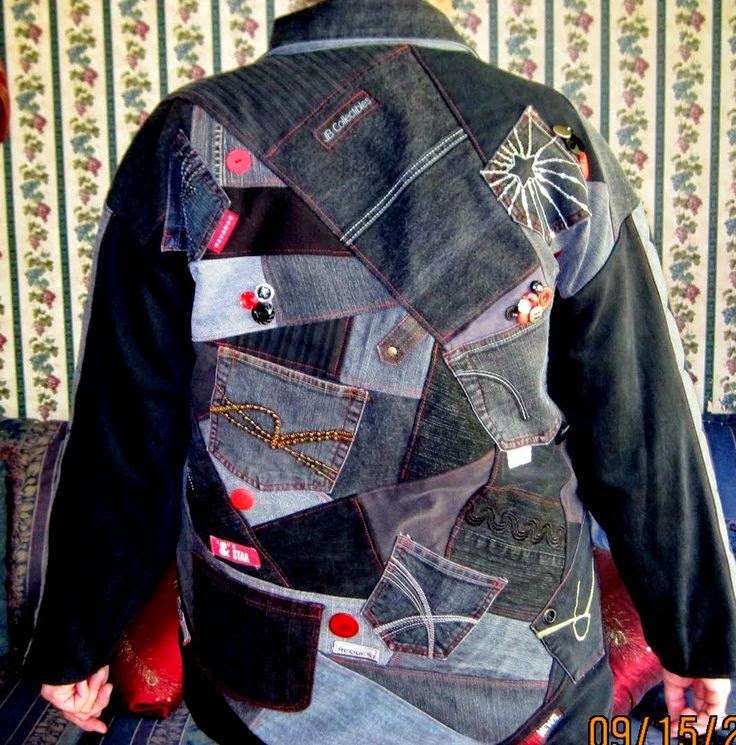 One of my other passions over the years has been working with recycled denim and above you can see an example of a crazy quilted denim purse and below is the back of one of my jackets that I made using previously-loved jeans. One of my favourite things to create right now are sewing hussifs and here you can see the front cover of one that I designed. I was thrilled to have both pictures and a how-to article on making these published in a 2013 issue of Pat Winter's 'Crazy Quilt Gatherings' magazine. If you scroll down through my blog (or click on 'crazy quilting' in my labels) you will be able to see portions of the rose-themed hussif I am currently working on. A further thrill was to be asked by Pam Kellogg to contribute one of my crazy quilts for inclusion in her 2015 calendar (available HERE). My work was featured for January and you can see a picture of my creation as my blog header. More recently the 'Crazy Quilt Gatherings' magazine owned by Pat Winter has been passed into the capable hands of Pam Kellogg and the first issue of the new 'Crazy Quilt Quarterly' magazine will available for purchase on MagCloud February 1st. Pam has again given me the honour of being the cover artist for her first issue, as well as inviting me to write a column for newbies. All this is hugely exciting for me and makes me think that perhaps I have 'arrived' in the crazy quilting world! Many of the players in 'Grow Your Blog' are offering little giveaways and I am no exception. I will be creating a rose embroidered needlebook similar to this one (below) and I will draw a name from those who comment on this post sometime on February 15th and announce the lucky winner then. Lastly, I want to extend a very large thank you to Vicki (and her helpers) for arranging this great fun blog hop for us to enjoy. I know it took a huge amount of time and dedication on her part and she deserves a standing ovation from all of us. Click HERE to go to Vicki's post to check out all the other blogs on the tour! Further to the possible imminent demise of my computer I'd like to ask those of you who own any form of computer tablet your thoughts on them. Good, bad, indifferent....I need to hear it all. If you are in like with the one you're using will you share the name and model? Does it talk nicely to the internet? Anything you think I need to know would be most welcome!! TIA! I spent nearly all day printing off pictures that I have stored on my computer...just in case they float out to the inter-ether never to be seen again. 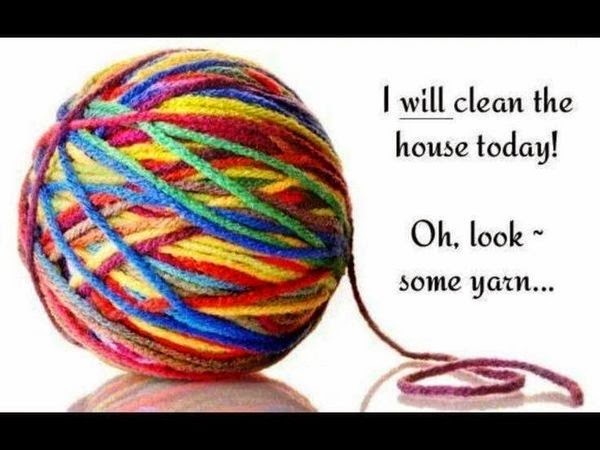 I've been meaning to do that chore but it's always been easier to just procrastinate. The ones I really value are now printed off and if I lose the rest I'm not going to be overly sad. Today the quote is from Eleanor Roosevelt (and was chosen because it's exactly how I feel about the step into the unknown I might be taking with this technology upgrade I'm facing)..... "You gain strength, courage and confidence by every experience in which you really stop to look fear in the face. You are able to say to yourself "I lived through this horror, I can take the next thing that comes along"
1. If I disappear off the internet for a little while don't be concerned. My computer seemingly is developing 'issues' and according to my #2 son the motherboard is working itself up into a hissy fit that will likely culminate in a meltdown. Fingers crossed I can get it fixed before that happens! 2. Some of you will remember that last year I was completely fascinated with a web cam that had been placed in an eagles nest and so much enjoyed watching what was happening on a daily basis. Well, the parents are back and there are eggs again! Go HERE to see! You can pop in for a look anytime, day or night. 3. 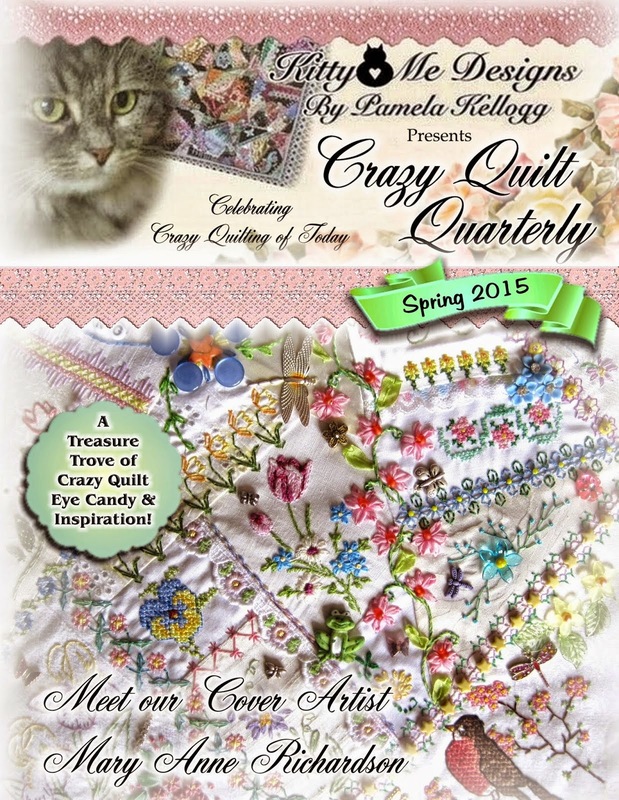 Pam Kellogg, the new owner of the 'Crazy Quilt Quarterly' magazine has just announced that she is making one year subscriptions available and you can go HERE for further information. A subscription to this would be a wonderful gift for a birthday, mother's day or any special occasion! How about treating yourself to something fun arriving in your mailbox four times a year? Maybe you know someone who is thinking about trying crazy quilting for the first time and is looking for inspiration? 4. Have a look at the incredible quilts made by THIS man!! You'll have to click on the pictures in order to progress through his gallery. Amazing work!! 5. I have begun work on the 'innards' of my hussif and this is the first thing I made. This will be part of a pocket I think. Or maybe not. And finally, here's the quote for today! This one is from James Dean.... "Dream as though you'll live forever. Live as if you'll die today"
Today I thought I'd share a little bit about the use of waste canvas with you. I'm by no means an expert but there are some tips I've learned along the way that might prove helpful. First of all, the waste canvas I purchase is made by Charles Craft (www.CharlesCraft.com) and I always buy 14 count. I find anything with a larger grid than that is simply too big for most crazy quilting applications. The packages come with a piece of canvas 12"x18" which is sufficient for a lot of crazy quilt seams. I think the first use of waste canvas was to apply designs onto the front of t-shirts (probably back in the early 70's or so) and at that time it was recommended that, once you had your design stitched, the waste canvas be moistened to make it easier to remove. I find just the opposite to be true for crazy quilting and that moisture is definitely NOT your friend. It turns the canvas threads into a gummy mess and makes them nearly impossible to remove. To begin, choose the design you would like to create and count the number of stitches in both directions. The most important count is the stitches from top to bottom. Cut a piece of waste canvas, plus a margin of at least five squares on both top and bottom, a little more than the length of your seam. At this point I fold the canvas in half in both directions and mark the centre with a permanent fine point marker. Center your canvas on your seam using the mark as a guide. Baste around the outside edges of your canvas to hold in place (you can pin it, but then you're constantly having to untangle your threads as you work - too much angst for me!!). Find the centre point of your design and begin stitching it at the centre mark you've made on the canvas and work your way to the end of your seam. Return to the centre and work out in the other direction. Try not to catch the canvas into your needle as you stitch. Remove your basting threads and then, using a pair of tweezers, start pulling each strand of canvas out one at a time. I always pull the short strands out. Taking your time with this step is important. Pull each thread carefully, keeping them straight as you pull. Pulling sideways (or upwards) will result in distorted stitches. If you find a strand difficult to pull out, try pulling it from the opposite side. After you remove all the short strands just grasp the edge of the remaining long strands and pull gently. Voila - they will slide right out and you're left with a beautifully stitched seam. I hope you find these tips helpful and will give waste canvas a try! Today the quote is from Georg Christoph Lichtenberg.... "Everyone is a genius at least once a year. The real geniuses simply have their bright ideas closer together"
Over the weekend I completed the outside of my rose hussif and now it's on to the goodies I'll be putting inside. These photos overlap somewhat because it's impossible to get just certain sections (altho' I guess I could have cropped them, couldn't I?). Today the quote is from Martin Luther King.... "All labor that uplifts humanity has dignity and importance and should be undertaken with painstaking excellence"
The painted rose was a brooch in a former life and now has been treated like a shisha mirror. Roses to the right were on a hankie. Web stitches with lazy daisy 'petals' on top, and a teeny little cross stitched rose bud. Spider web roses with lazy daisy leaves and french knots. This rose was made with french knots in the middle and surrounded with stem stitch. a couple of weeks ago? Today the quote is from Leo Buscaglia...."A single rose can be my garden...a single friend, my world"
There has been a bit of discussion going on in the online class (Swathed in Stitch) that I'm taking with Karen Ruane about dragons and I mentioned that I have a resident studio dragon that oversees my work from above. Her name is 'Ellyllon' (Elly for short) and is one of my favourite creations. all that goes on in my studio. She was created in 2010 from a pattern ('Draconis') designed by Amy of Anlina Designs. Amy was kind enough to ask me to be a pattern tester for her and this is what came from her pattern. I was hugely excited and honoured to be asked to test her pattern and even happier to become the mom of Ellyllon. If you'd like to see more pictures and read more you can go to my original post HERE. Today the quote is from Seneca..... "What a great blessing is a friend with a heart so trusty you may safely bury all your secrets in it"
Another waste canvas cross stitch. Cross stitch flower, crocheted trim, blackwork flower (also done on waste canvas), and a seam treatment using ric rac. Cross stitch leaves, ribbon roses, bullion loops and french knots to create a seam treatment. Today the quote is from Haim Ginott.... "If you want children to improve, let them overhear the nice things you say about them to others"
Yes, there are roses everywhere. No real ones, unfortunately, but stitched ones are almost as good. When I completed this little heart I was almost ridiculously happy with it. It only measures a little over one inch in height! Cross stitch on waste canvas and silk ribbon flowers. This rose reminds me of the embroidery that my grandmother did. Just simple outline stitch. A yellow rose - done using a blackwork pattern, also on waste canvas. Today the quote is from William Hazlitt...."None but those who are happy in themselves can make others so"
Before I get to the photos of the slow but steady advancement on my rose hussif, there's a couple of things I'd like to talk to you about. I will tell you that when I first sent a photo of my work to Pat Winter for consideration for the original 'Crazy Quilt Gatherings' magazine, I was terrified. What if she hated it? What if she told me that under no possible circumstance would she ever in a million trillion years EVER publish a single thing I had ever made? (and yes folks, all that went through my mind). 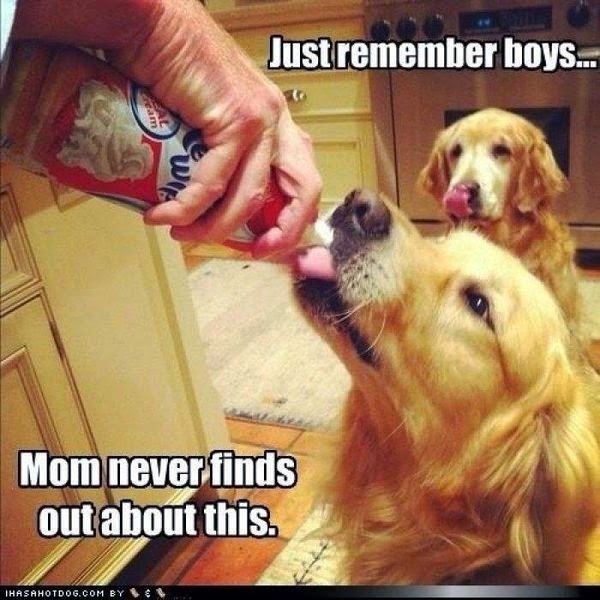 Well - I needn't have worried....and the point I'm trying to make (and yes, I do have one) is that you shouldn't either!! Don't be scared, don't think your work isn't 'good enough' and above all don't hesitate to contact Pam and share what you're doing. Believe me, it's a wonderful feeling to have your work shown in the magazine and you can also believe me that it doesn't hurt a bit!! Now, having said all that, I also want to point out that the success or failure of a publication such as this is entirely in YOUR hands. Yes, you. It's up to you to support it....it's up to you to swallow your fears and submit your work. and let's see your work! on-line beginner crazy quilt class. and registration closes Jan. 13th. Today the quote is from Mark Twain... "Courage is not the absence of fear, but the mastery of it"
The small seam treatment (above) is simply done with cross stitch on waste canvas. To the left....the lower seam treatment combines a design from Pam Kellogg as well as some silk ribbon roses that were gifted to me (thank you Irene!). The seam to the right is another cross stitch/waste canvas one. The roses on the upper left are pre-done on a hankie. with silk ribbon spider web roses and beads. Today the quote is from Frank Bering.... "Live your life and forget your age"
All of these treatments were done using waste canvas and regular embroidery floss. I added some blending filament from Kreinik to the petals on the top rose to give it some sparkle (hard to tell in this photo). I loved that rose so much that I decided to make a little needlebook on black using the same pattern. This one also has Kreinik blending filament. It's for a wee giftie, so hopefully the recipient will like it! Today is a quote from Susan B. Anthony.... "Sooner or later we all discover that the important moments in life are not the advertised ones, not the birthdays, the graduations, the weddings, not the great goals achieved. The real milestones are less prepossessing. 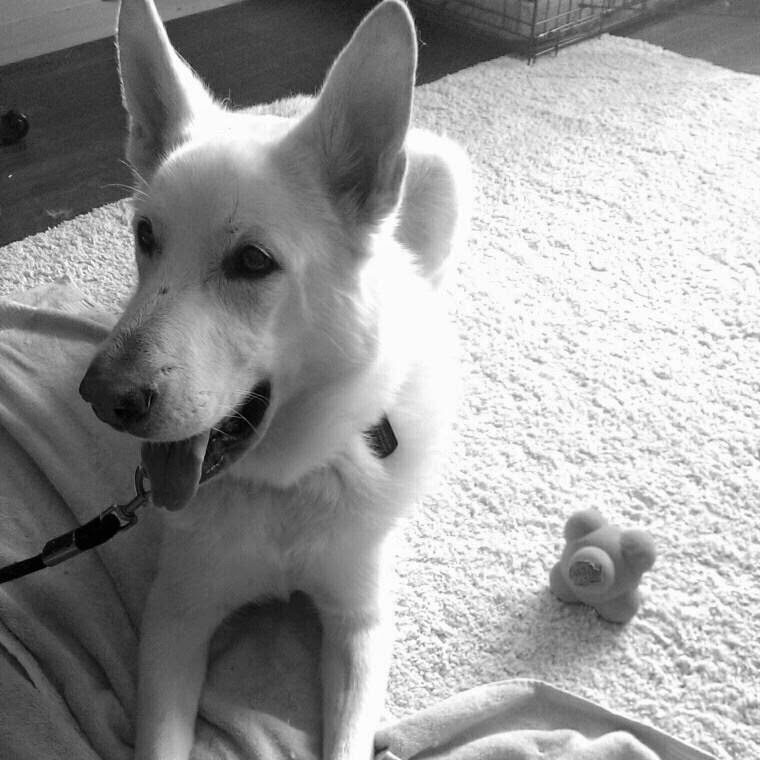 They come to the door of memory unannounced, stray dogs that amble in, sniff around a bit, and simply never leave. Our lives are measured by these"
I know it's not nice to blow your own horn, or to brag (and really and truly I'm not doing either... much), but I have to show you this!! Some of you might remember that I did two 'secret' projects last year and that I wasn't allowed to post any pictures. Some of you might remember that I announced what the first secret project was awhile ago, and if you'd like to refresh your memory, have a peek in my sidebar and look for the 2015 crazy quilt calendar that Pam Kellogg spearheaded. My work was 'January' (and is also the piece you currently are seeing in my header on the blog). To say I was over-the-moon-excited when Pam asked me to take part in the calendar was an understatement!! Well, secret project number two involves the new 'Crazy Quilt Quarterly' magazine and if you're interested in seeing just what I'm yammering on about go HERE to Pam's blog and see her announcement (and a sneak peek) about the magazine. Today the quote is from Pete Goss.... "My parents taught me that I could do anything I wanted and I have always believed it to be true. Add a clear idea of what inspires you, dedicate your energies to its pursuit and there is no knowing what you can achieve, particularly if others are inspired by your dream and offer their help"